I hope that those of you celebrating Thanksgiving last week got to spend some quality time with their family and friends. Maybe there were a few odd moments and uncomfortable silence but heck, that's family dynamic right?! Our holiday was kind of bittersweet. A house full of close friends, kids, games and laughter interrupted by the news of B's uncle passing away the day before Thanksgiving. Lots of time spent on the road visiting relatives and work/gigs that would not take a vacation (except for Thursday of course). 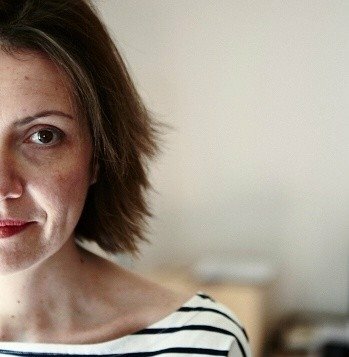 When calm finally found a momentary reprieve on Friday, I looked around at the little bodies running about the house, verrines of Grapefruit And Pomegranate in Tea Jelly being lined up on the table, friends sitting down together and decided to keep the sweet part of bitter closer to my heart. I've had this recipe and post in my draft box since Friday but have not had much chance to sit down with my thoughts and write something coherent. The first thing I did that morning was to rush out of bed and drink about a gallon of grapefruit juice. My body was obviously gearing up for detox mode. I pretty much spent the rest of the day noshing on grapefruits, oranges, kumquats (citrus season is just around the corner here in the South) and drinking copious mugs of tea. When I get into this mode, I make sure to never run out of anything tart, sour, juicy and fresh (hmm sounds like I could be describing B's sense of humor!). It's not that we ate a lot, we just ate at odd hours and foods prepared by salt-shaker happy relatives. I know I am not the only one who drank a pond came Friday morning but I always wonder: what type of foods do you crave after a few extras? It hit me at three in the afternoon that I should turn all these lovely, clean and fresh ingredients into a dessert that we could all enjoy. One of our friends loves those little fruit and jello cups sold at the grocery store and I know from a sure source (his wife) that it's about the only instance he'll be seen with a fruit. I like the concept (I'm French, anything "aspic" related is part of our food DNA) but I don't like the idea of additives, extra sugars and what not. I also like fruit over gelled mass a lot more. Plenty of reasons to make these at home and play a good game of Scrabble while they set. 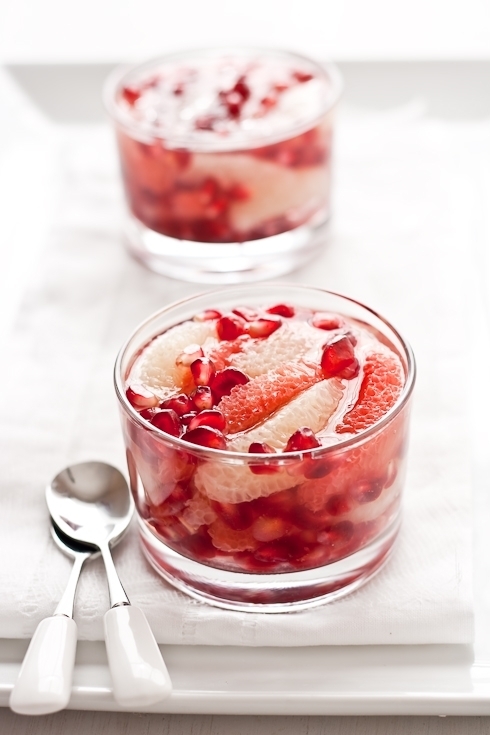 I packed glasses and other ramekins with a combination of white and red grapefruits, sprinkled a small handful of pomegranate seeds over each of them and poured just enough white tea jelly to seal the deal. After a couple of hours in the fridge, we had the healthiest and most flavorful fruit dessert of the week. Suddenly my feet starting tapping on the floor, I began to giggle and fidget in my seat. My energy was back! So was my brain and the ability to come up with endless possibilities for these! We made a couple of other batches, one with pomegranate juice and one with Grand Marnier for a more festive and grown up version. For a clean presentation, I like to spend some time making sure I properly segment the citrus, removing as much of the white membrane as much as possible. Click here for a good explanation on how to do it. 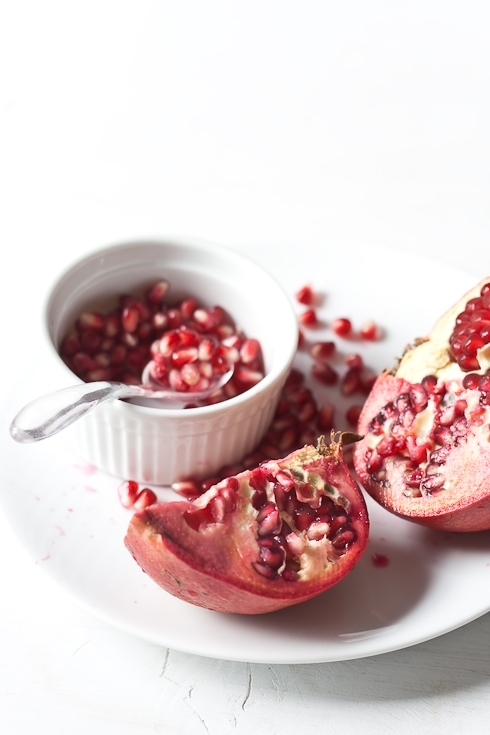 On the same vibe, pomegranate can make a royal stained mess and if more cleaning is not on your list that day, click here for an illustrated step-by-step. In a small bowl, sprinkle the gelatin over the cold water. Reserve. Steep the tea into the boiling water for 2-3 minutes or to the strength you prefer. Add the sugar and reserved gelatin mixture until both are completely dissolved. Let cool a few minutes. 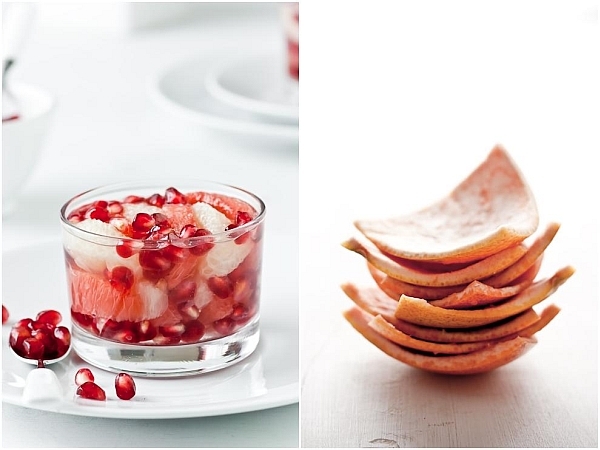 Divide the grapefruit sections and pomegranate seeds evenly among four glasses or ramekins and pour just enough tea jelly to reach the top. Refrigerate until set, about 2 to 3 hours. 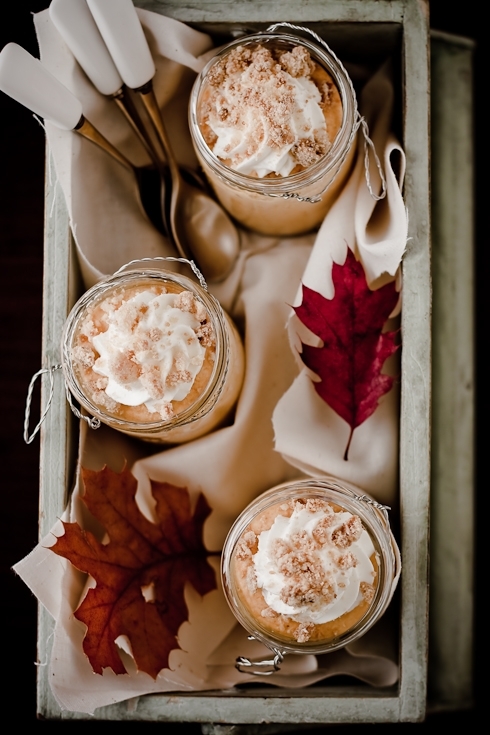 Instead of making pumpkin pie for Thanksgiving this year, I am bringing Pumpkin Semifreddo to my sister-in-law's. It's a riff on one of the desserts we had last week in Asheville and given that we devoured 8 of them in record time, I am pretty sure his family will also appreciate the change. 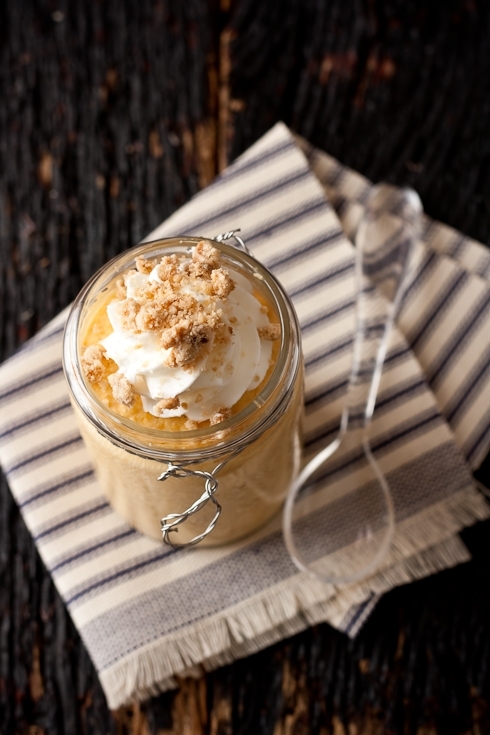 It's cold, creamy, mousse-like with a nice crunch from the gluten free streudel on top. Makes me think of Fall with every bite. 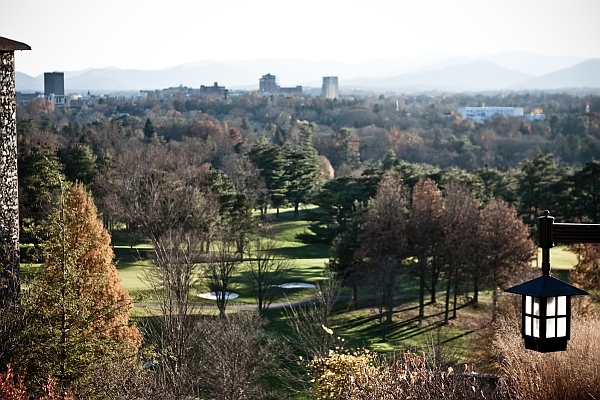 I have always had a soft spot for Asheville during Fall and Winter. When we lived in upstate SC, we would take the beautiful mountain roads and drive around the area, always making a pit stop in there. 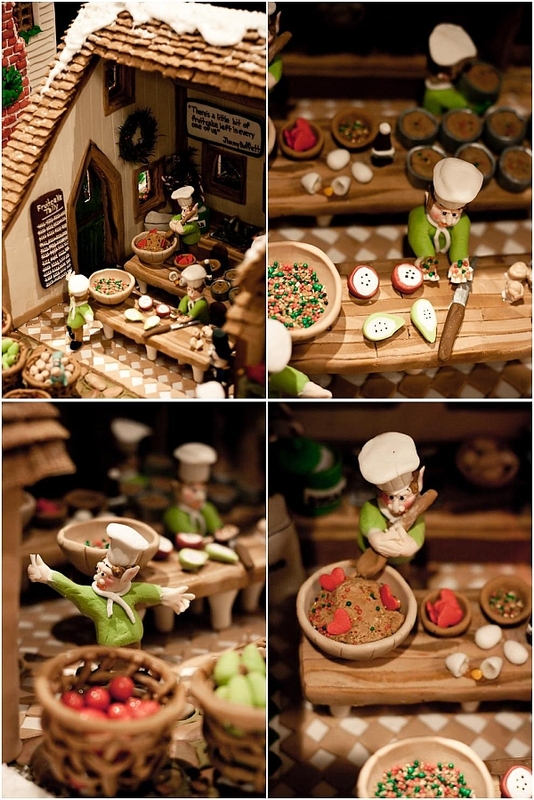 We had an impromptu getaway in Asheville one Christmas years ago and I dragged B. through the gallery of gingerbread houses on display at The Grove Park Inn. I knew there had been a competition. I had no idea I'd be judging it one day, 5 years later! And with a beautiful friend and work peer as my traveling companion to boot. Arriving at The Grove Park always makes me feel like I have steppped back in time, somewhere around 1935 when F. Scott Fitzgerald could have been my almost neighbor in room 441 (we were in room 552). Truly a special place, yet one that evolved perfectly with time and where people are the embodiement of Southern hospitality. 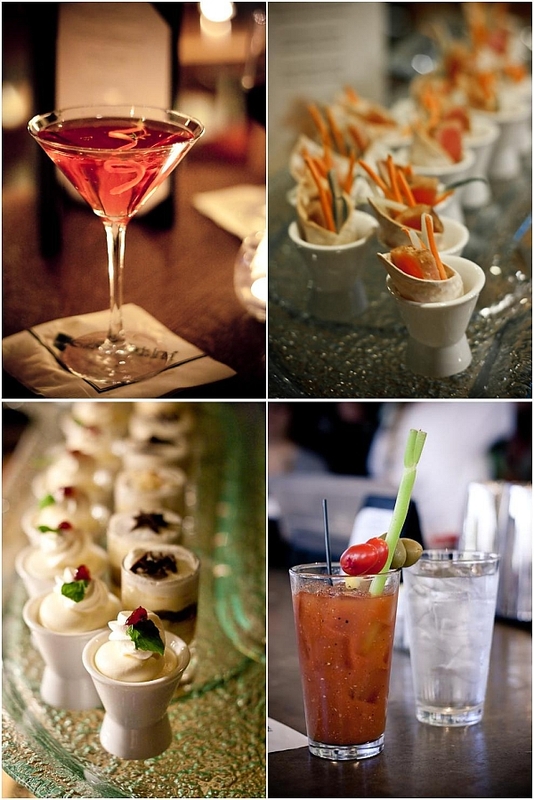 Fun, gracious, never stuffy and most of all with some of the best foods and drinks around. I love the view out my kitchen but waking up with this everyday made me rubb my eyes quite a few times. Was I dreaming? What do they put in those drinks that one is constantly beaming to be so peacefully there? Wait, don't answer that one. Maybe it's the food. Maybe it's the mountain air. On Saturday night, we all gathered for a "Meet&Greet" among the judges and were treated to some fabulous finger foods prepared in the nick of time by one of the hotel kitchens. Crab salad shooters, various kinds of sushi, potstickers, sliders, shots of lemon mousse and Tiramisu. A special drinks menu prepared just for us and greatly enjoyed by yours truly. The Gingerbread White Russian was as close to liquid dessert as one can get. Don't be fooled though...they hit you like a brick about an hour later. In hindsight I am quite glad I started the day with a virgin Bloody Mary at Corner Kitchen and burned a couple of calories walking through the River Arts District with Tami and Dodie whom we met on our previous trip there (from Asheville CVB). Yes, there is something magical about The Grove Park this time of year and if you are a sucker for holidays, Christmas, trees and ornaments as much as I am, you will be in heaven walking through the hotel right now. There is a tree in front of every window, each with its own theme. 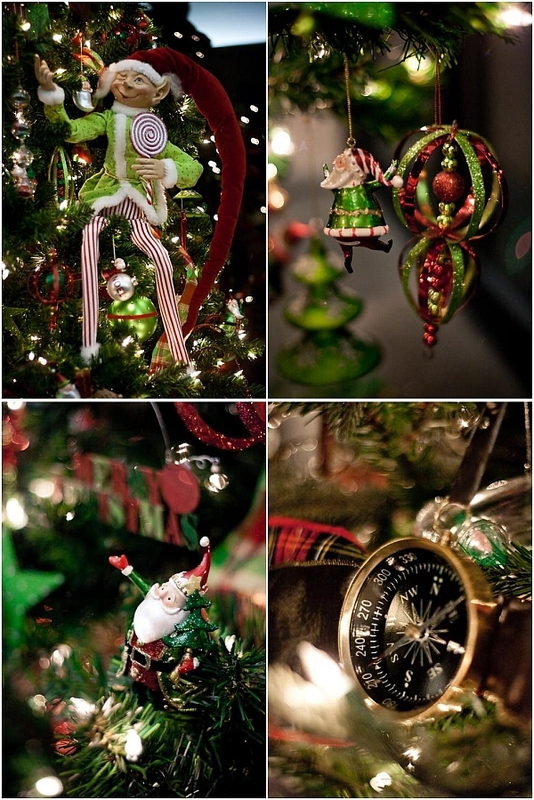 Whether you are a coffee or vintage addict to a Santa and gingerbread figurine lover, you are sure to find a tree for you! 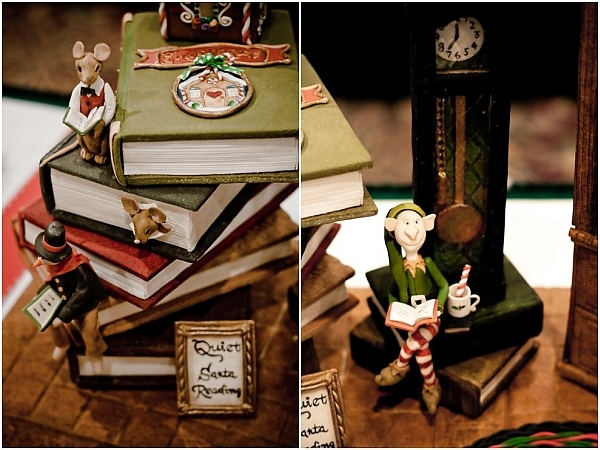 My head was spinning at every corner of the hotel with all this whimsy! Glad I found a compass to navigate my way around, down the stairs, up the elevator, around the piano bar and back to our room! Actually, this much fun is highly conducive to good nights of sleep. I sleep very little and yet I had no problem here putting my brain to rest, close my eyes and sleep a full night. This proved extremely important for the reason I was there in the first place: judging the National Gingerbread House Competition™. Yeah! Get to work Helen! Stop having that much fun with trees! Trust me, this is not an affair taken lightly by anybody. From the competitors entering, to the staff wheeling the houses in the main ballroom to the judges, armed with clipboards and scoring sheets. One random thing that hit me around noon is that I should have had more than coffee that morning. 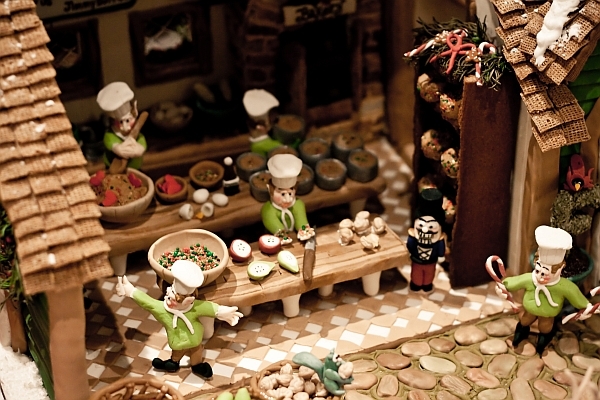 After looking at two full rows of houses, the smell of gingerbread was making my stomach growl and my concentration weep. We had 5 criteria on which to base our scores and we took plenty of time to evaluate each and every house thoroughly (from 9.30am to 4.30pm). There are times when putting the camera down is appropriate, especially when you are surrounded with such seriousness as Colette Peters, Nicholas Lodge, Mark Seaman and Steve Stellingwerf pointing to you the latest trends and techniques. To be honest, just to hear the words pastillage and wafer paper was sending me back years ago when I use to eat, drink and sleep that stuff for work and I *had* to put the camera gear to the side. I did however sneaked in toward the end and while a hired team was taking full shots of the houses, I wanted to focus on the details and the artistry behind some houses. 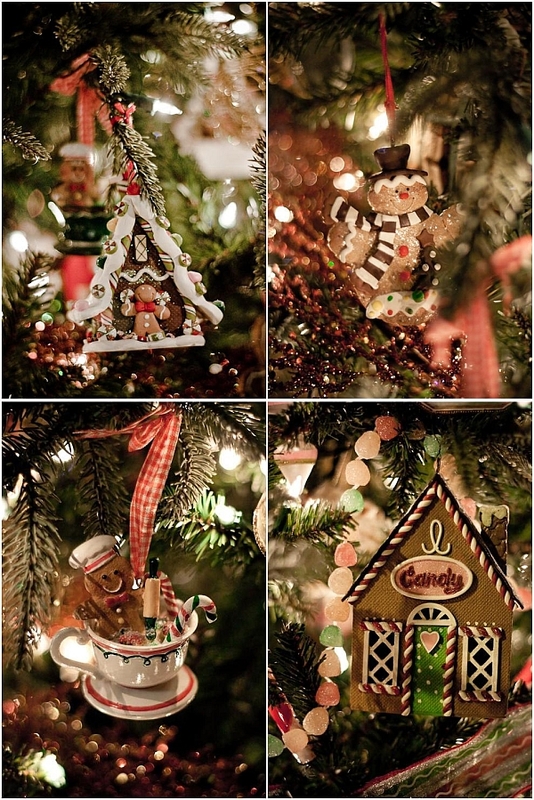 These are some of my favorites in design and whimsy although they did not make it to my top picks as they did not have enough "gingerbread" elements which is what we had come here to judge. Sometimes you have to put your heart waves aside and focus on that spread sheet. The grand prize and other winners in each category can be viewed here. I did marvel at The Fruitcake House (pictured above). All the details were blowing me away. From the floor tiling to the cracked eggs on the work table, the nonpareilles, the fruit cake tally chalk boards and so forth and so on. Another one I admired was the first place winner. It reminded me of the of A Christmas Story and the details were so whimsical and aesthetically perfect that everyone had to stop and admire that one. For some judges, there was "not enough gigerbread" to win Grand Prize for others, it was "the one". Yeah, I know, we're tough, but in the wash-out of scoring and tabulating, I think that we indeed picked all the houses that deserved to be in the Top 10. I just love the aesthetics and color scheme of that one! It was a long and exhausting day but we were rewarded with a fantastic dinner at Horizons where I had the chance to sit across Colette and Steve and talk shop, sugar and cake for a few hours. I was also blown away by Mark's fluent French and truly envy his yearly excursion to France to tour Patisseries. Before I get to the recipe I want to extend a huge "Thank You" to my fellow judges, to Jeff, Brian "The Gingerbread Man", Susan, Ron and Rick who made our stay so pleasant and memorable. You guys know your stuff and do it well. Bravo. We have had many reasons to feel lost this year but we have many more reasons to be grateful, starting with our family, our friends and your constant support and visits. Thank You. Have a fantastic Thanksgiving! During our lavish dinner at Horizons at The Grove Park Inn, we were presented with a delicious selection of desserts, some I had had the pleasure to make before and one that made everyone ask for more, the Pumpkin Semifreddo. I did not ask for a recipe because it is pretty straightforward to reproduce and instead of doing a full blown plated dessert as we had that night, I served mine in jars and other ramekins for a more casual presentation. In the bowl of a stand mixer equipped with the whisk attachment or hand held one with ballon whisks, beat the cream until it just holds soft peaks. Refrigerate it while you prepare the base of the ice cream. Wash your bowl and whisk attachment. In a heavy saucepan, stir together the honey, sugar, and the water. Bring to a boil over medium heat. Since you are not making caramel, it is ok to stir occasionally until the sugar is dissolved. Let it boil and bring the mixture registers 238°F on a candy thermometer. This second part is easier to do with a hand held mixer than a KA for example since the quantity of egg yolks is small and the bowl tends to be deep in some models. It works, have no fear...it's just easier with a hand held one. In the clean bowl of your mixer, still using the whisk attachment, beat the yolks for a minute to loosen them up. Reduce speed to medium and pour the hot honey mixture in a steady stream over them. Go fast enough to prevent the eggs from scrambling but not so fast that you end up with most of the syrup on the wall of the bowl or the whisk. Continue to whip at medium-high speed until the mass is completely cold and airy. Fold about one third of the chilled whipped cream into the semifreddo base to loosen it up and make it easier to incorporate homogeneously. 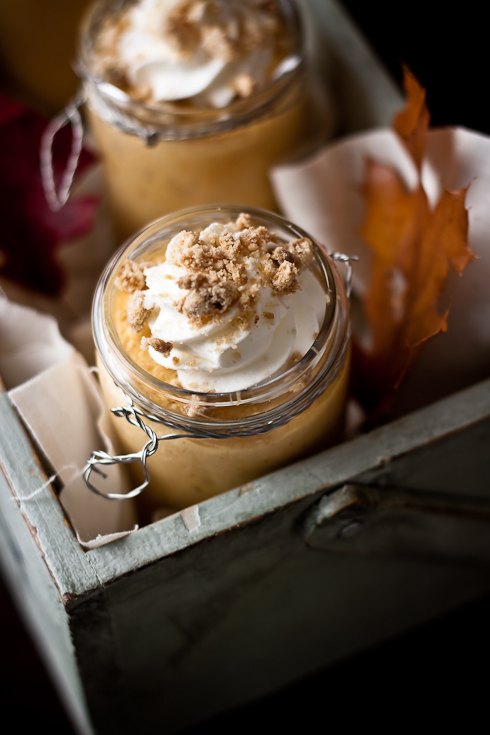 Add the pumkin puree, the spices and the remaining whipped cream and fold until everything is incorporated. Divide mixture evenly among dishes cover with plastic wrap and freeze until set. In a medium bowl, blend the flours, sugar and butter with your fingertips or a pastry cutter to form large clumps of dough. Lay them on a parchment lined baking sheet and bake for 25 minutes or until golden brown. Let cool to room temperature before breaking the clumps into smaller crumbs. When ready to serve, take the ramekins out of the freezer 15 to 20 minutes ahead of time so they have a "half frozen' consistency and top each semifreddo with some crumble and some whipped cream if desired. [Full Disclosure] As a guest of The Grove Park Inn, I did not pay for the room and dinners (friday through monday). Any meals and drinks that were not part of the group scheduled ones (saturday brunch-nightcaps at the hotel) were paid by me. I drove my own little self there, on my own little gas money. 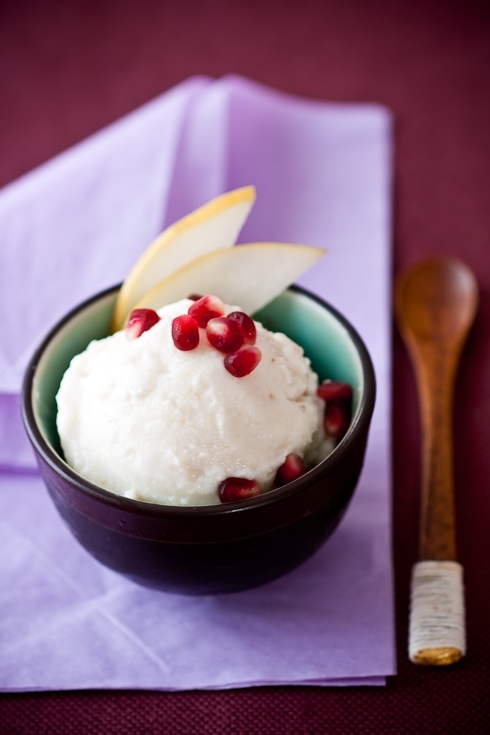 Before I tell you about this Asian Pear Frozen Yogurt, I want to thank everyone who stopped by to enter Ree's cookbook giveaway. The woman is well loved, that's for sure! My random number generator this time was my friend Tami with whom I went to the National Gingerbread House Competition™ and to be fair, I didn't take into account the entries coming in past the deadline. Congratulations to Patricia in Texas, a., and Jelli Bean. Email me your snail mail addresses at mytartelette[at]gmail[dot]com and I'll pass the info on to Ree. That part lasted from 9.30am until 4.30pm. Yep. Tami who was not on jury duty booked a nice and lengthy massage at the spa, (another kind of heaven!) and there was a brief moment I wished I was there with her but I had a serious task at hand. 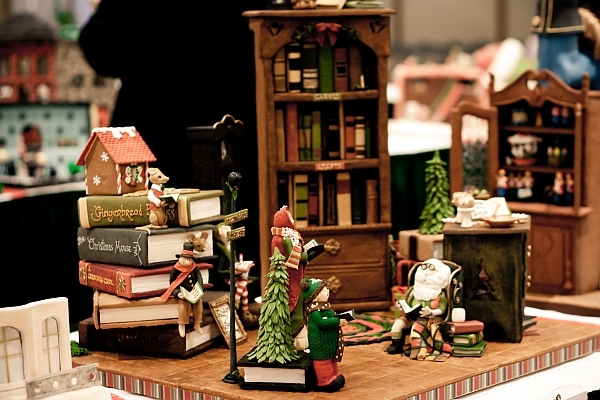 Gingerbread houses at The Grove Park Inn is serious business folks! As in every competition, some of my chosen picks did not win Grand Prize or first place in some categories but that's ok, it's part of the maths behind it all. Driving the 250 miles to Asheville gave me my fix of gorgeous Fall colors and foliage. I did stop a couple of times along the way to take it all in. 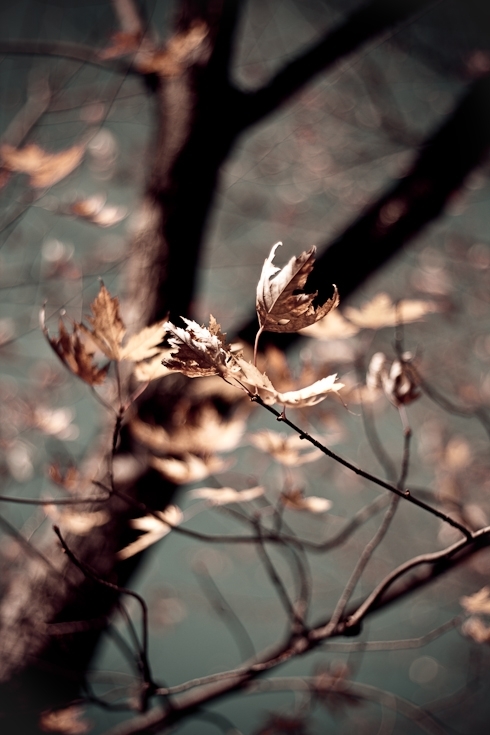 I called B. and yapped about the reds and the golds I was seeing while he was racking brown dried leaves in the yard under a hot sun and no wind. He asked if there was some Asian Pear Frozen Yogurt he could have afterwards and lucky for him, I had not completely eaten the batch I had made from Jaden's cookbook! Trust me, I am not kidding when I say I almost ate the entire batch. That frozen yogurt is seriously addicting. I was hoping B. would focus on all the other dishes I had prepared in anticipation of my weekend away but no, he had to ask about the frozen yogurt! My fro-yo, how dare he?! Eh, that's alright, I was feeling bad he was stuck at home with work while I was gallivanting working hard with Tami in the mountains of North Carolina. I discovered Asian peasr for the first time when I moved to the US where almost every week I would be faced with a new item, either typically Southern or completely exotic as was the case with these pears (as well as prickly pears, dragon fruit, jicama, okra, etc...). I was intrigued. It was juicy, firm, sweet but the flavor was completely unique. You can easily find your share of bland ones, but if you pick the small ones, they will be packed with flavor and juice. Jaden's frozen yogurt recipe couldn't be any simpler: pears, sugar, ginger, sugar and Greek yogurt. Chop, process, churn. And eat. She tops hers with some crushed pink peppercorns for a little sweet kick but I was out and particularly pressed for time to get more. 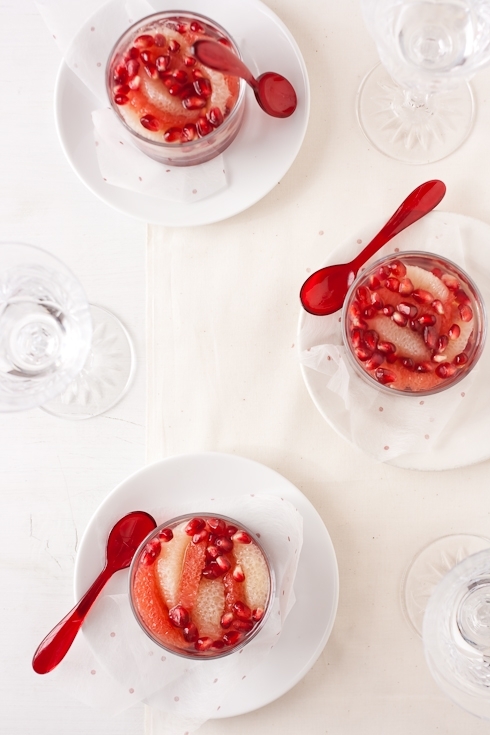 Instead I topped ours with pomegranate seeds which gave the frozen yogurt a nice tart note. 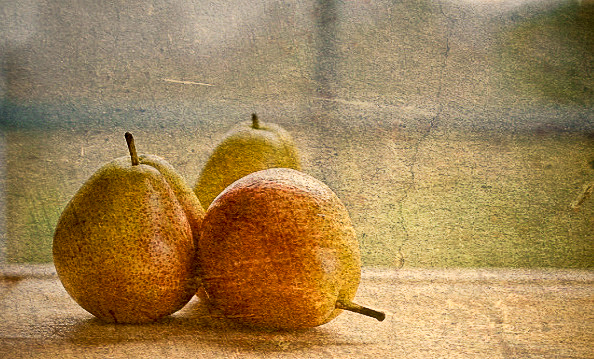 Peel and chop the pears into small 1/2-inch chunks. Toass them with the lemon juice to prevent oxidizing. In a blender, combine the pears and ginger and puree until smooth. Use 1-2 tablespoons of water if this is difficult to puree. 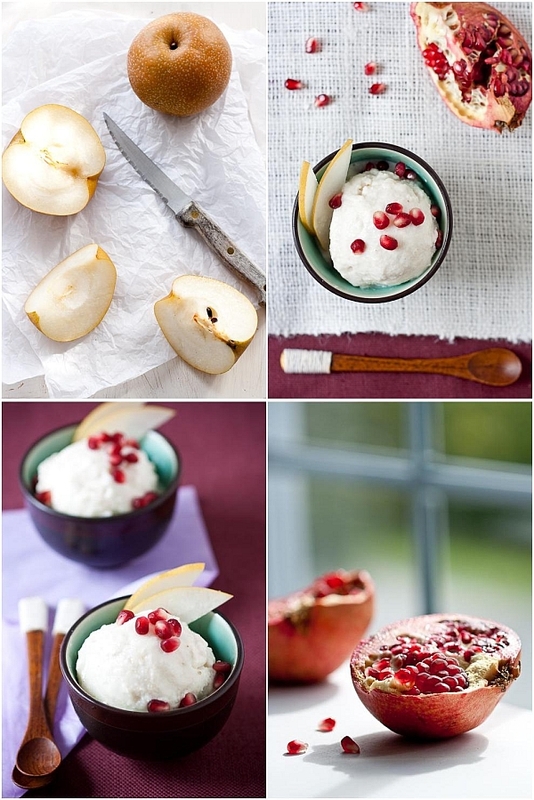 In a large bowl, combine the pear puree with the yogurt, sugar and salt. Refrigerate for an hour. Note: I skipped this step by refrigerating the pears for a couple of hours before. Churn the mixture in your ice cream amker according to manufacturer's directions. Once churned, freeze until firm. Serve topped with the pink peppercorns. When I ask my father what vegetables he wants with dinner, his response is often "potatoes" to which I reply "Dad! We already have a starch. What vegetable would you like?" He then looks me with an obvious smirk and repeats "potatoes". I am very much my father's daughter in that regard. Love them. And noodles. I hope I never have to chose between the two. As much as I am a potato gal, I never thought of putting them on pizza, until last week that is. 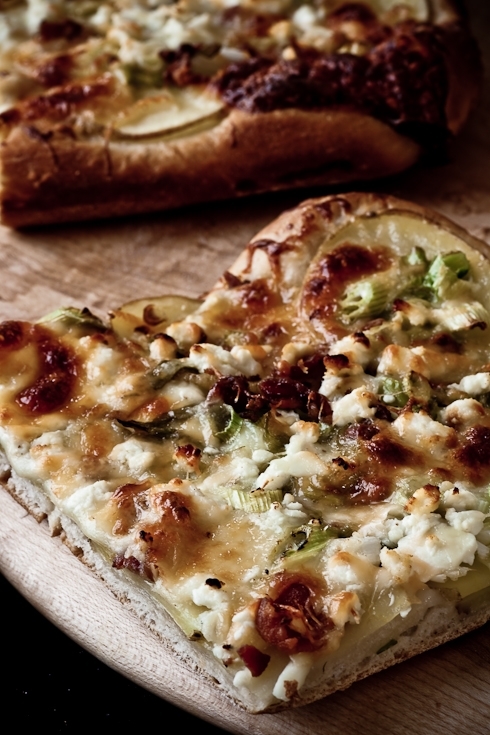 This Potato-Leek Pizza from The Pioneer Woman has surely changed my mind. "More!" I say! I remember very distincly the first post I read on Ree's site. I was on the phone with a friend back home who wanted to know how to make cinnamon rolls. We may have many a delicious pastry back home but I think we sorely miss out in the cinnamon rolls department. As a very occasional baker, she needed visuals. I searched step-by-steps online and stumbled on Ree's site. Bingo! My friend had an official teacher, willing to take her by the hand through the whole process. I had found a treasure trove of All American classics that my husband grew up on. He never says so but it's good to split my cooking between my French and his American. Makes for a fun relationship. Much like potatoes and pizza actually. Ree lives on a ranch in the middle of vast great lands. I live in a house on stilts in the middle of marsh land. She has four 2-legged offsprings, I have two 4-legged companions. She married a cowboy who herds cows for a living. I married a man of the last frontier, history teaching. In her cooking, Ree makes do of what is available in her neck of the woods. I had to learn quickly what is Lowcountry cooking. Her cookbook is #1 in the New York Times Best Sellers list. Mine is still being edited (more on that later, promise) See...completely the same. Ahah! Don't these fancy baby leeks look like glorified green onions? I don't know Ree. Sure I have met her at BlogHer Food in San Francisco and exchanged a few words but that's about it. Yet, and I don't know how she does it, she is one of the most kind hearted ladies, taking time in her incredibly busy schedule and many roles to make you feel like what you say did not get lost in the big emptiness of the internet. I can guess it has got to be mind boggling for her how life has changed for her family in the last few years. It would make people feel uneasy, others would get the big head. Yet, Ree remains her natural, super nice, dorky self. I do need to say that she made me blush bright red when she put me in the same sentence a Matt Armendariz at BlogHer. Ugh! Ree's cookbook reads like a novel. 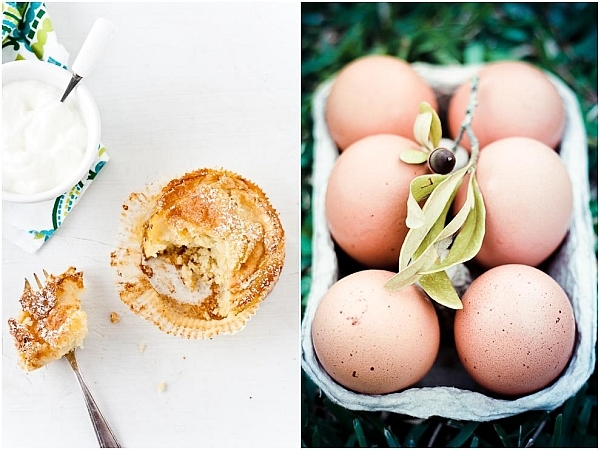 There is food and there is life on the ranch, life with the kids, daily thoughts and aspirations. The one most excited about getting the book was my husband however. He can relate to the recipes, they were part of his mom's stapples. He thought that whereas I fought the generation gap with his mother and the can of Ro-Tel, I would relate to Ree's fresh approach to life and cooking as she was trying to adapt to her new territory. He was right. Copies of my mother-in-law's Little League cookbooks are collecting dust but The Pioneer Woman Cooks is being earmarked by the both of us. He seldoms cooks so he loves the step by step pictures while I skip those for the stories. I like stories. Ree's book does not need another review, yet I can tell you that B. is extremely excited to eat "Pioneer Woman" this weekend while I am away. I have been invited by the great folks of The Grove Park Inn in Asheville to be a judge in their annual National Gingerbread House Competition. I am not only extremely honored but thrilled to be in a group comprising Colette Peters and Chef Lodge to name a couple. I thought that B. would be able to accompany me but he's stuck with gigs this weekend. Instead, gal pal Tami from Running With Tweezers is coming up from Atlanta to share some of the fun and mountain air. In preparation of the trip, I made a few things that Bill loved and that he could easily reheat at night. 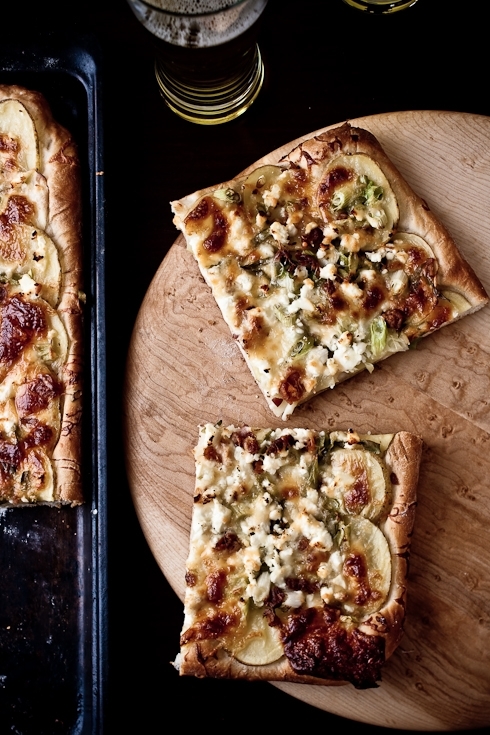 One of them was this potato-leek pizza except it was devoured the moment it came out of the oven (well, after a few pictures). I felt a bit pioneer-ish shopping for the ingredients when the only leeks I could find were fancy baby ones (did not have time to get to another store). Despite the double price tag, they looked a lot like green onions to me and I think I even aggravated the store clerck when I said so. I hate to aggravate them because they do order fancy stuff for me when I ask them. They are indeed green onions and they did taste like leeks however so all's well. 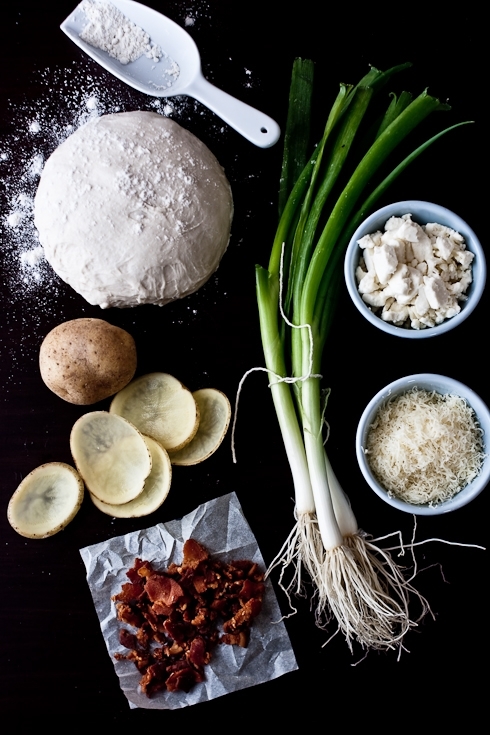 The combination of potatoes, leeks, bacon ang goat cheese made me think of Frenchified loaded American baked potatoes meeting their Italian cousin on a bed of mozarella and tender pizza crust. Awesome...and I am packing two slices for the road. - ONE entry per person - if you don't see your comment right away, give me a few hours before re-posting as I have the moderator on. - Enter until Wednesday November 18th at midnight, US eastern time. Begin by frying bacon pieces in a skillet over medium heat until cooked but not crisp. Remove bacon from pan and pour off most of the grease. Set bacon aside. Return skillet to stove and turn heat to medium-low. Slice leeks very thinly. A sharp knife helps. Add leeks to the same pan and sauté over medium-low heat until soft, about 3 minutes. Remove from heat and set aside. Using a sharp knife or mandoline, slice potatoes very thin. Prepare pizza crust according to directions, and drizzle lightly with olive oil. Sprinkle lightly with salt. 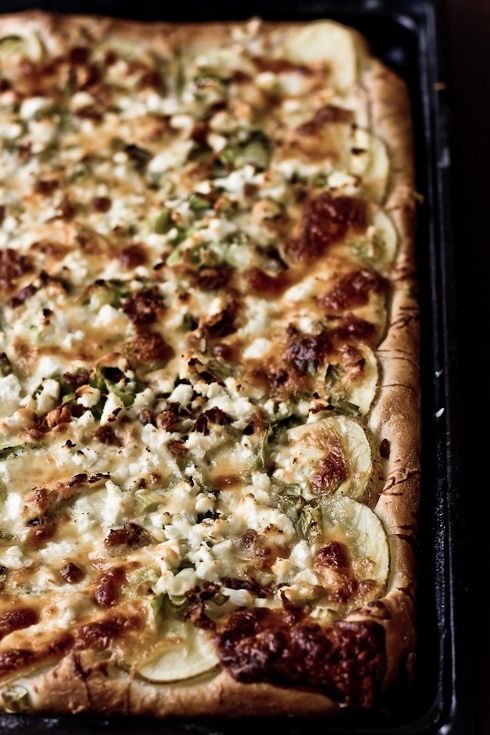 Arrange potatoes in a single layer all over crust, slightly overlapping edges. Sprinkle potatoes lightly with salt, then lay mozzarella slices in a single layer over the top of the potatoes. Place sautéed leeks over the top of the cheese. Next, sprinkle the fried bacon pieces over the top, followed by a generous addition of crumbled goat cheese. Finally, sprinkle with freshly ground black pepper. Bake pizza for 8 to 11 minutes, or until edges of crust are golden brown and cheese is melted and bubbly. 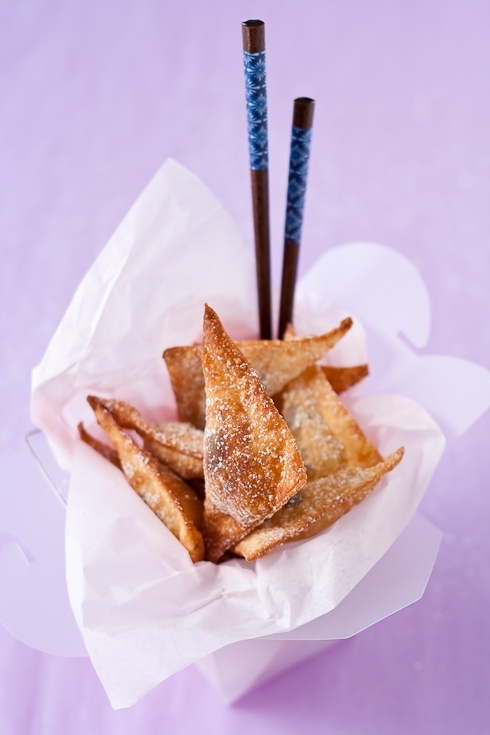 Cut into wedges or squares and serve immediately. Pour warm water into a mixing bowl. Sprinkle yeast over the water. Stir together flour, olive oil, and salt in a large mixing bowl. Add water/yeast mixture and stir together until just combined. Dough will be very sticky. Drizzle a little olive oil into a clean mixing bowl. Toss the ball of dough in the bowl and turn over to coat in oil. Cover bowl and place in a warm place for 1 to 2 hours, or cover in plastic wrap and store in the fridge for up to 2 days. I appreciate this time of year when night falls so much earlier. It makes me want to rush home and cozy up with loved ones, a book or a good project. Unlike summer when things are so bright up in my face, I love that Fall and Winter are seasons of shadows and angles with night and day playing cat and mouse so well. So many holidays around the corner. So many friends dropping by, parties hosted and kitchens in full roar. Time to connect and reconnect with people and things. Time to lose half your brain too if you don't pay attention! When things get plenty busy, it's always good to have a few staples in your kitchen repertoire that are not only show stoppers but easy to prepare and make ahead, almost ensuring your guests will ask for more. My holiday staples almost always include cremes brulees, pots de creme, and panna cottas. Among the variations I like on this traditional Italian favorite, these Pomegranate and Caramelized Pear Panna Cottas have come to rank high on the list. Panna Cotta is said to have originated in the northern region of Italy where dairy is one of the main agricultural productions but spread out to the entire nation and the rest of the world throughout the years. Variations of panna cotta exist in almost every country as it is a very convenient way to use up extra dairy like cream, milk and yogurt. 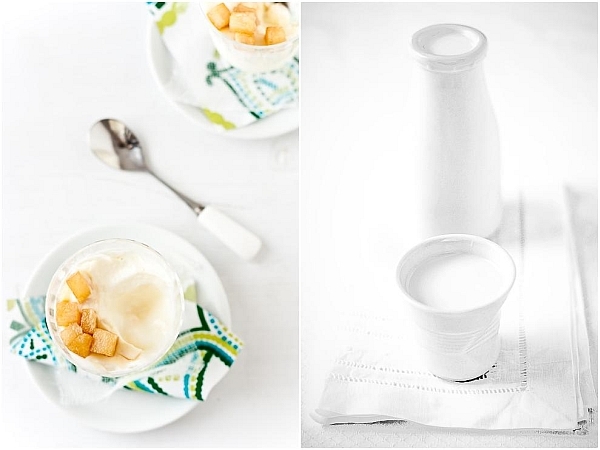 I grew up on Blanc Manger for example which is a close cousin to the creamy silky no-bake Italian custard. There are many, many reasons to start putting panna cottas on your list of "reliable-good-things-to-make-for-people-I-love." For starters, what is really fun about panna cotta (beside listening to an Italian saying it outloud) is that you can add flavors and ingredients inside, outside, above and below. You can also mix up the choice of dairy to be used as long as you make sure to balance the acidity and fats of each appropriately. You can prepare them up to 48 hours in advance and keep them snuggled up in the refrigerator until ready to eat. You can top them with whatever strikes your fancy that day or what is available during the season. And...they are gluten free! 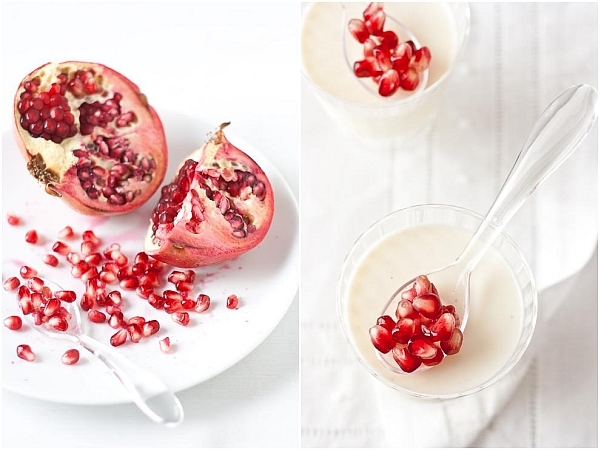 November is synonymous with pears and pomegranate to me. Where my mother-in-law tries to find the biggest Comice and Bosc pears for cooking, I tend to favor Seckel and Forelles, my absolute smaller favorites. Where she feels like she hit the jackpot with the biggest pomegranate on the shelf, I always dig for the tinier ones. Yes, I like small and tiny anything but for a reason. Almost everything here is bigger than where I am from. Bigger roads, bigger houses, bigger stores and bigger produce which unfortunately doesn't always mean bigger on taste. I often find that smaller fruits and veggies pack so much more flavor and I'd rather have a small anything full of aroma any day like small servings of creamy and silky Panna Cotta. Can I say out loud how much I love caramel? If you know me a tiny bit, you know that the mere idea of caramelizing anything gets me moving. When I made these panna cottas for a catered event earlier this week, I kept the base relatively simple with just a touch of vanilla bean and focused more on the toppings. I caramelized some seasonal Forelle pears with just a touch of butter and brown sugar and kept them at room temperature until the guests were ready for dessert. 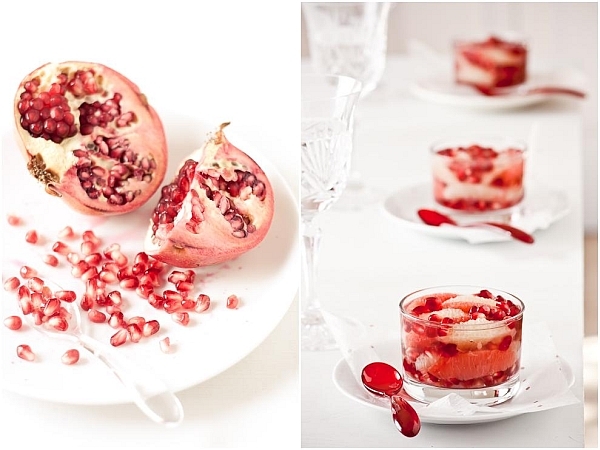 However, when it comes to pomegranate, nothing beats eating them straight out in their natural form. I just love the tart pop that comes with biting into pomegranate seeds. 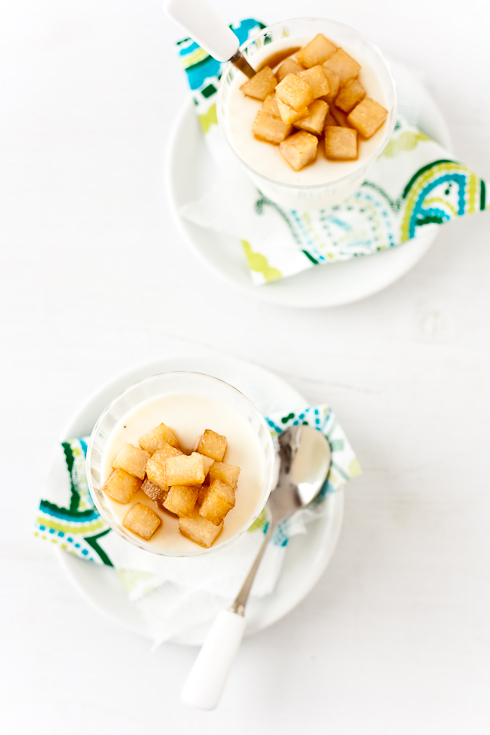 They were just the perfect texture and color contrast to the richness of the panna cottas. One thing that you can play with and never reach the end of your playtime when it comes to Panna Cottas (beside the flavors) is the combination of dairy you use. Most recipes give you a combination of heavy cream and milk, some add buttermilk or/and yogurt to the mix. All are good, all work...in the proper ratios. If you use more acidic dairy like buttermilk and yogurt (even full fat) make sure to keep twice the amount of heavy cream in the mix. The more acidity is mixed in, the greater risk you run of the base separating into one part cream, one part whey. Nothing to do at this point but to start from scratch. Live and learn. If I can save you a major "Oh no!" and an extra trip to the store, then I've done my job! 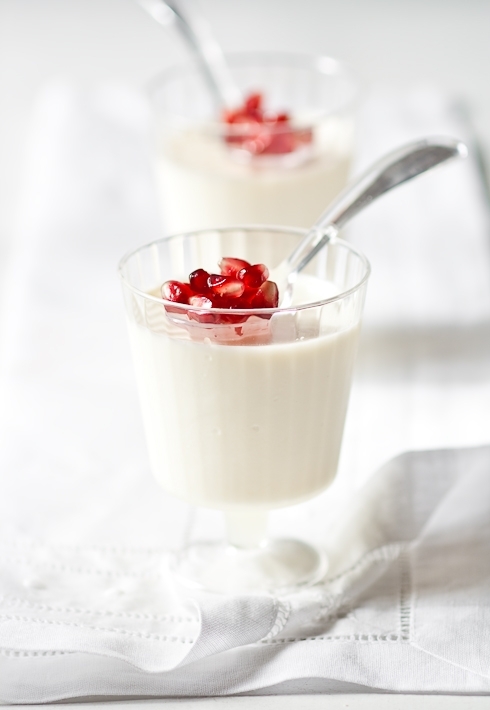 If you are vegetarian or vegan, panna cottas can still be well within your dessert favorites. You can substitute any of the dairy for their vegetarian or vegan equivalent such as soy, almond, oat, hemp milks or vegetarian cream as long as they are the full fat kind. Panna cottas rely on the addition of gelatin which is a no-no if you are not a carnivore but kosher gelatin is often vegetarian and agar agar and carrageen are often used as substitutes. I am not proficient with any of these but you can find more information in this article on their nature and preparation. Panna Cottas are pretty much a bottomless well for your tastebuds and imagination. Notes: I make my own yogurt and used a freshly made batch in this recipe but you can substitute with store bought plain full fat yogurt, just don't use light, pretty please. If you are not used to working with gelatin, in all its various forms, I recommend this article written by David Lebovitz. Gelatin won't be a mystery anymore! In a large heavy bottomed saucepan placed over medium heat, bring the heavy cream, sugar and vanilla bean seeds to a simmer. When the cream is hot, remove from the heat and whisk in the reserved gelatin until it is completely dissolved. Add the yogurt and whisk until well blended. Divide the mixture among 8 glasses or ramekins. Let stand at room temperature for 20 minutes and then refrigerate for at least 4 hours before serving to let the cream set properly. In a heavy sautee pan set over medium heat, melt the butter and sugar together. When the mixture starts to sizzle, add the pear dices and sautee them until they start to become translucid and a little soft to the touch, about 2 minutes. If you cook them too long, you will end up with pear compote which is good too, but does not have the same biting contrast as barely sauteed pears. 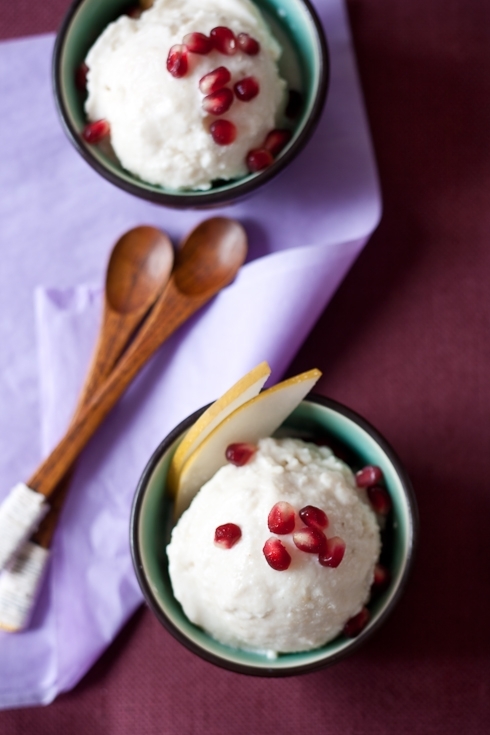 Top the panna cottas with some caramelized pears or pomegranate seeds as desired. If I were to wait for the proper weather to bake certain desserts, I'd never get to turn the oven on or fry some donuts and the ice cream machine would be churning year round. Take Halloween day, it was near 90F pretty much all day long and yet I wanted to bake some fun goodies for the neighbors. We spent the day in short sleeves, going about the neighborhood with the kids steaming in their costumes. More than one of them thought ill of their parents for dressing them up as a furry teddy bear or a heavy padded alligator. I know these feelings disappeared when I brought down these hot Chocolate Wontons and a batch of Tonka Bean Ice Cream that we had with glasses of apple cider...on ice. Years ago we used to have a different chocolate special everyday at the restaurant and certain mornings proved difficult to come up with a bright idea at 5am when I was hand deep into kneading baguettes. I remember opening Chocolate Passion by Timothy Moriarty and Tish Boyle with the assurance that I'd have a winner and often recommended it to patrons asking me for a recipe. When I stumbled upon Maury Rubin's Book Of Tarts, I think I baked just about every one of them they were so creative. Sometimes it's a technique or a subject that makes me delve in a cookbook. Sometimes it's the story behind its coming to life, an anedocte, the writing. Sometimes it's the author and her/his journey. In short, something that moves me beyond the recipes (I have quite a head full of those already) which is the case with Jaden's first cookbook, The Steamy Kitchen Cookbook, from which I made the chocolate wontons. Having shared a plane, meals, drinks, and a panel with her, I can tell you that Jaden is good people and I am extremely proud of her. I knew her book would be one I could open at any page and cook something new, delicious and fresh. All four recipes I have made so far were a hit with us and our friends. If you were to come to my house you'd think I spend all my spare change on cookbooks. If you looked a little closer, you would see a fine print on most reading "preview copy", "press release copy", etc... About twice a week, the mailman makes the hike up to the front door and drops a new box on the porch. He also leaves a couple of doggie treats for the pupps. They know it, they go crazy until I get to the door. What do I do? I open the box, I flip through the book and get the post-its out. "This one will be great for friend S." or "This is one for R." and so forth. I am very appreciative of this situation, believe me and I am under no obligation to review or pimp them out on this site. I know that a friend would benefit from a crockpot recipe book more than I will since I don't own such a beast, or my baking-challenged friend S. might enjoy a basic dessert cookbook more than I will. But there are books I hoard, read, cook and bake from, hoard again, read some more and cook from until the hinges get worn out. Jaden's book will be one of them. I must give Jaden kuddos for the dessert section though she said it was tough to write. 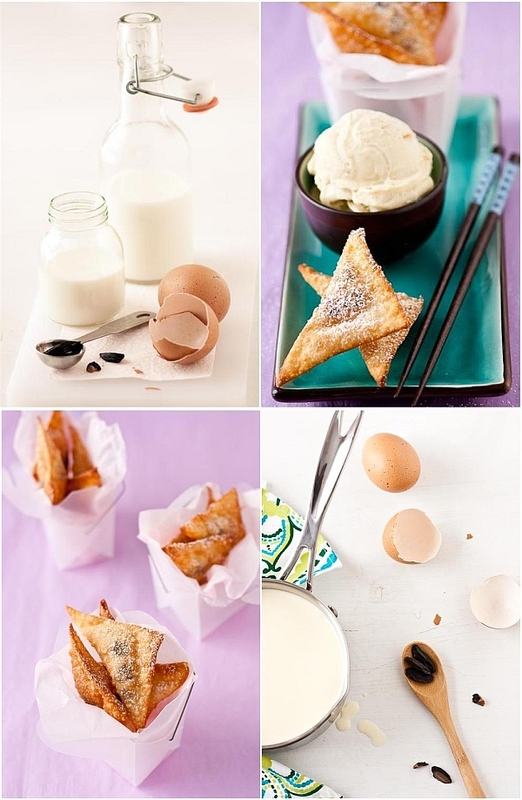 Her approach to dessert is very much what we like throughout the week: fresh fruits, easy to prepare frozen treats and the occasional splurge like the chocolate wontons. The headnotes say they will make little girls squeals and little boys break out into a disco dance (I am paraphrasing) and the neighbors' kids did just that on Halloween when I handed them out! I think I even saw a couple of adults shake their bootie in delight too! In a small bowl, make an egg wash by whisking together the egg and the water. On a clean, dry surface, place a wrapper down with a point facing you. Place a piece of chocolate or chocolate chips near the top end of the wrapper. Brush a thin lauer of egg wash on the edges of the warpper. Fold the bottom corner up to create a triangle and press down at the edges to remove as much air from the middle as possible. Make sure the wrapper is sealed completely. Repeat with the remaining wrappers and chocolate pieces. 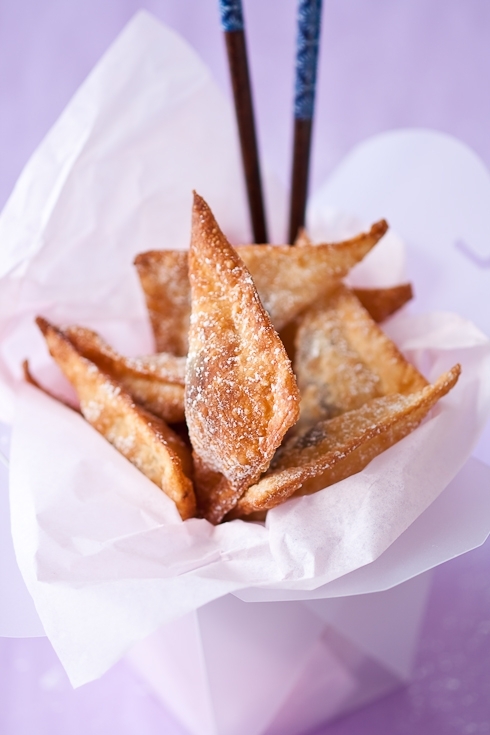 Keep the prepared wontons covered with a piece of plastic wrap or a damp towel to prevent them from drying. In a wok or medium pot (I used a 9-inch cast iron pan), heat about 2 inches of oil to 350F and gently slide a few wontons into the hot oil. Do not crowd the pan as the oil temperature would lower too much and you would end up with grease-soggy wontons. Fry 1 to 1 1/3 minutes on each side until both sides are golden crisp. Notes: Yes, tonka beans are banned from import in the US by the FDA, yet they are used by many countries in food preparation and desserts in particular. Consumed in large quantities, they can be toxic as they contain an anticoagulant which many blood thinning medications are based on, courmarin. So, it's banned, but its main agent is used in meds here and you can purchase tonka beans on ebay. UGH?!! Gotta love the FDA and large medical companies politics. Since I use 2-3 beans a year in recipes that feed no less than 8 people each time, I know we are ok but research and educate yourself before cooking with tonka beans if you are interested. By the way, if you have vanilla extract from South America in your pantry and wonder why it smells like a vanilla bean got too close to an almond one night, that's probably because tonka beans were used instead of real vanilla or diluted with it to make it cheaper to sell. Nothing wrong with that if you are aware of all the facts. Tonka beans smell like a cross between vanilla and almond extracts and if you can't find or do not wish to use tonka beans, substitute with each extract in the ice cream recipe and you will get close to the actual flavor. In a large bowl, whisk the egg yolks and the sugar until pale and thick. In a saucepan set over medium heat, bring the milk, cream to a simmer, without letting it come to a full boil. With a microplane, grate the tonka bean right over the milk and cream simmering (I add the little knob left for extra flavor). Slowly pour the hot cream over the egg yolks mixture while whisking to temper the egg yolks. Pour the whole mixture back into the saucepan and cook over low heat, stirring constantly, until the cream coats the back of spoon. It should register 170F on a candy thermometer. At this point you have made a custard sauce, also known as "creme anglaise". Let cool completely, strain and refrigerate until cold, preferably overnight. Once and the custard is cold, process according to your ice cream maker manufacturer's instructions. I know I am going to jinx it. I just know it. Maybe if I whisper it very softly: It finally feels like Fall around here. Mostly in the wee hours of the morning when I can finally feel a chill in the air and a dry breeze through the marsh. Actually, not having a free day on the schedule until April means that the season has indeed changed. Drastic times call for drastic measures and I often turn the comfort of my mom's apple cake during the Fall and holiday season. 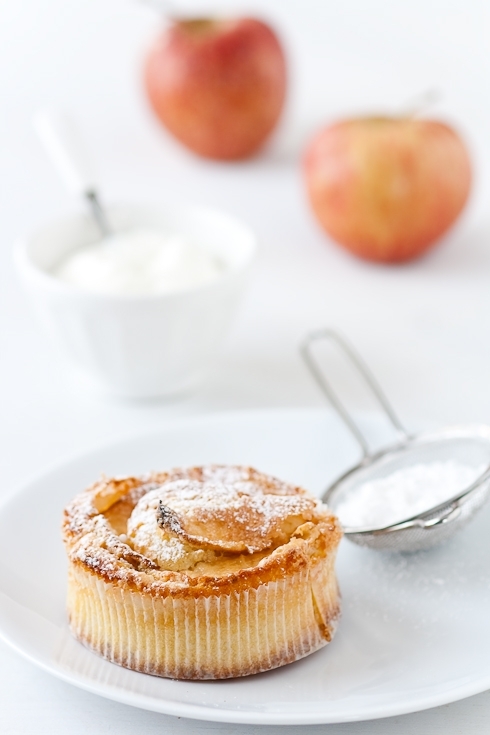 The one cake that earned her the affectionate name of Maman Tupp and the one we know as "Gateau Aux Pommes Tupp". I am pretty sure that most French people reading are familiar with the "Gateau aux Pommes 5-4-3-2-1" that the brand Tupperware® introduced during home demonstrations of their products. A very simple, very unassuming and particularly delicious appple cake, soft and moist all the way through. It was especially known for its creamy butter and sugar topping forming a tempting thin crust while baking. For years, I thought that was my favorite part of the cake. Now I know. Two slices with some creme fraiche is my favorite part! When you are 5 or 6, saying that you would like the "Gateau 5-4-3-2-1" for "gouter" (4pm snack) is not only long but it does sound silly. However, it made it very easy to start baking with mom at an early age since the recipe went something like "5 spoons of flour, 4 spoons of sugar, 3 spoons of milk"...and so on. 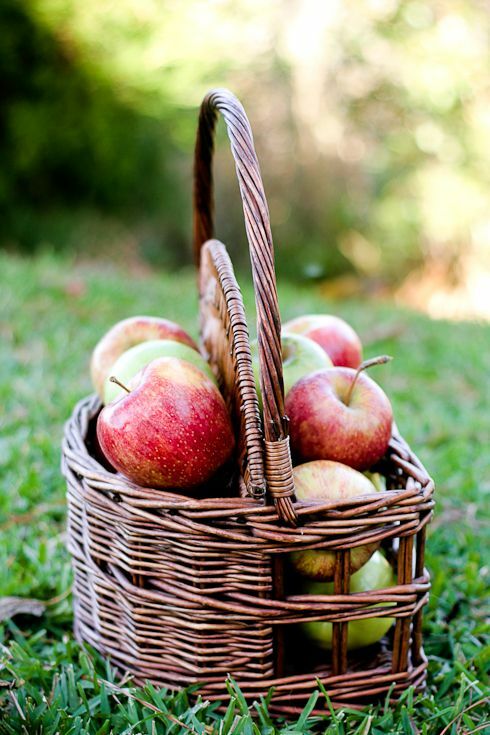 One bowl, one spoon, dry before wet, one apple, whip it all and bake. 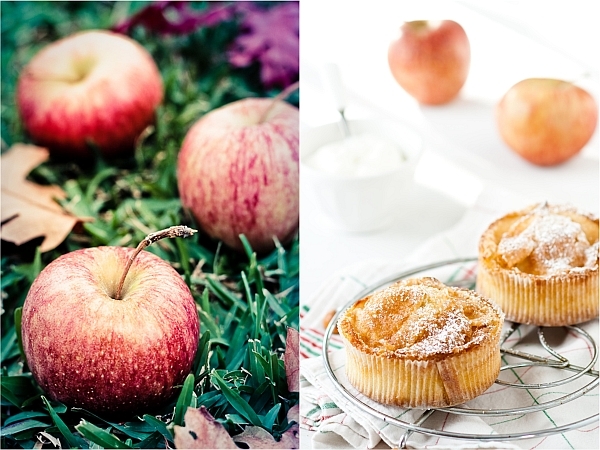 We made it so often in my family that it became much easier for everyone to call it the "Gateau Aux Pommes Tupp" (Tupp Apple Cake) and over the years to make it even shorter with a simple "Gateau Tupp". See, it works so much better to beg mom for it this way. This simple gateau became the one we would gather around during tea time on a cold and rainy day, the one that made any bad school day be forgotten in a few whisks of sugar. It solved a few arguments and mended broken hearts too. Yes, my mom was a Tupperware® lady back in the 80s. She never played the sales game, but she loved to host parties for friends getting in the biz. That was her thing, the hosting. And the baking, the cooking, and passing around trays of items made with the brand's products. Let's face it mom, you also loved getting new stuff for the kitchen. To this day she is still very well stocked in containers, molds and measuring instruments of all sorts from the big T company. It was very fortunate that my parents in law dropped off a basket full of apples from a recent visit to an orchard in North Carolina and I made a big dent in it baking a few of these cakes. In the end, the cakes are nothing like the original recipe. I made ours a tad less sweet and gluten free which is perfect here to keep the cakes moist, thus not following the original "5-4-3-2-1" formula. Then, there was the matter of the spoon measure called for in the original version. I don't own such an instrument but I figured that since the company was American, a large spoon such as the one mom used had to be close to 1/4 cup. Yes, in this cake, precision to the gram has very little importance and that's just what I need when swamped. Now, if you'll excuse me, it's time for my daily slice...Or mini cake. Notes: if you do not intend to make a gluten free cake, replace all the gluten free flours (rice, tapioca, sorghum) with 1 1/4 cups all purpose flour. The cake bakes in two separate times: first for 10 minutes, the remove it from the oven to add the cream topping and bake for an additional 20 minutes. I added cardamom just because it reminds me even more of my mom but you can skip that part or add cinnamon instead. Preheat the oven to 350F. Spray or butter the inside of a 9-inch round baking pan or several 3 to 4-inch baking pans if you want smaller cakes. Place them on a baking sheet and set aside. In large mixing bowl, whisk together the flour, sugar, cardamom, salt and baking powder. Reserve. In another large bowl, whisk together the milk, oil and egg until just blended. Slowly pour the liquids over the dry ingredients, whisking well to make sure that everything is well incorporated, about 40 to 50 strokes. 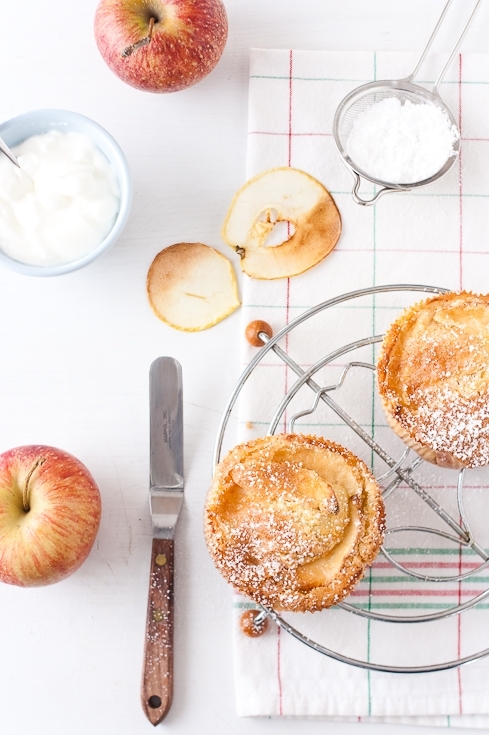 Pour the batter into the prepared pan(s) and arrange the apple slices on top in a circular pattern. Bake the cake(s) in the oven for 10 minutes. Remove the cake(s) from the oven and spread the creamy butter topping over the top(s). Bake an additional 20 minutes or until a skewer inserted near the center comes out clean.